The mother hands her baby to the female messenger, who is dressed in her finest clothing. She in turn hands him over to the male messenger, who, wearing his tallit, prayer shawl, carries the child to where the circumcision will take place. Some have the custom to pass the child from person to person, involving many of the participants as messengers.7 The kvatters, however, should be the ones to pass the baby from where the women are congregated to where the men are congregated. The connection of the body with G‑d is cemented during the circumcision, and etched upon the body forever. The ritual circumcision is considered greater than any other commandment, because it directly connects the physical body with G‑dliness, in a revealed and eternal manner. Rama, Yoreh Deah 265:11. The mother, who brings the infant to the synagogue, cannot pass him directly to the father. 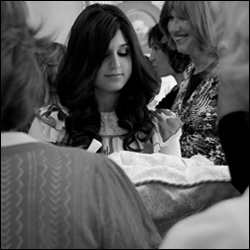 When a woman gives birth, she refrains from any physical contact with her husband until the blood stops flowing from her womb, and she counts a week of “clean” days, followed by immersion in the mikvah (a ritual bath). See Brit Avot 5:3. Brit Avot 5:26. See The Lubavitcher Rebbe, Rabbi Menachem Mendel Schneerson, of righteous memory, in Lekutei Sichot, vol. 22, p. 58, f. 29. Ramah 265:1. One stands in honor before someone who is fulfilling a Divine Commandment (see Tanya, ch. 46). The Lubavitcher Rebbe, Rabbi Menachem Mendel Schneerson, of righteous memory, in Lekutei Sichot, vol. 22, p 56. See The Wedding Procession on our Jewish Wedding site for a similar escorting ceremony. Dovid Zaklikowski is a freelance journalist living in Brooklyn. Dovid and his wife Chana Raizel are the proud parents of four: Motti, Meir, Shaina & Moshe Binyomin. Why Do We Have a Circumcision? Circumcision is the first commandment given by G-d to Abraham, the first Jew, and is central to Judaism.